Rotorua in New Zealand is a unique part of the world with incredible geothermal wonders, beautiful lakes and forests and stunning landscapes. It is no wonder there are some epic photo opportunities. Photographers and Instagrammers get your camera ready, we have a created a must-see list of beautiful places in Rotorua, so you can get that perfect photo and make all your friends extremely jealous! Happy snapping, Instagramming and sharing on social media! Don’t forget to share your photos with the hashtag #RotoruaNZ. The stunning Champaign Pool is one of New Zealand’s most colourful geothermal attractions. You will find the Champagne Pool located at Wai-O-Tapu Thermal Wonderland which is also home to unique volcanic features, including the Lady Knox Geyser. Park entry provides access to the world-famous Champagne Pool, which heats up to an impressive 260 degrees and creates the stunning orange and emerald-green colours. This is definitely one for your Instagram! Be amazed by the natural geothermal activity in Rotorua as you take a stroll through the gardens of Kuirau Park. This geothermal gem is located in centre of town and is free to visit. In the park, you will find an abundance of exciting mud pools and hot springs. Don’t miss the most spectacular and photogenic section of Kuirau Park, a geothermal wooden walkway located near the intersection of Ranolf Street and Lake Road. Here you can feel the heat come up under the bridge as you walk across and get this magical snap! Lake Tarawera, meaning ‘Burnt Spear’ is one of the most picturesque lakes in New Zealand. It is famous for its size, rainbow trout and for the Tarawera eruption in 1886. The landing is the closest access point to Lake Tarawera and well-placed jetty makes for a magical photo opportunity with an unbeatable backdrop. The Whakarewarewa Forest, also known by locals as ‘The Redwoods’, is home to the spectacular mix of towering native and exotic trees. It is without a doubt one of Rotorua’s greatest treasures. Head to the information centre for the best photo opportunities of the Redwood Memorial Grove. 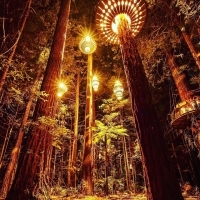 A real treat is to experience the Redwood Nightlights, a magical display of lanterns which light up the forest from dusk. The Rotorua Museum is said to be one of the most photographed buildings in New Zealand. Unfortunately, the Kaikoura earthquake in November 2016 caused damage to the foundation and the interior of the museum is currently closed. But don’t fret, as you can join one of the daily free tours of Government Gardens run by the Rotorua Museum and get that all-important photo! This extraordinary building looks fantastic from any angle – day or night. From the early evening, beautiful lights showcase the museum, and during the springtime, the Government Gardens are loaded with colourful tulips as a part of TulipFest. Getting to Rotorua: Rotorua is located in the central North Island, approximately three hour’s drive from Auckland, with easy access by car, flight or bus. 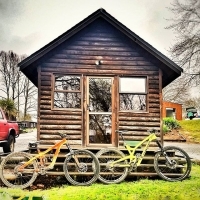 Where to Stay: Rotorua Thermal Holiday Park is a fantastic, affordable, family-friendly accommodation option with campgrounds, motel units (and very Instagram-worthy cabins! ), and free thermal hot pools!